Or, the 15 minute meal that I can’t stop eating. These are seriously, horrifyingly, embarassingly easy. They are what I want to eat for breakfast every day and what I make for dinner when 1. Eddie isn’t home and/or 2. I have no idea what else to make for dinner. That’s like all the time, really. Do you ever have those nights when you’re like… NOTHING sounds good to eat but you’re super hungry? That’s where these come in. Make ’em. Try ’em. Serve them forever! It’s 11:13 PM right now and I’m about two seconds and a whole lot of laziness away from making one of these for a late night snack. They never not taste good. NEVER. It’s that or cinnamon sugar toast. Pick your poison. I’ve made breakfast tacos before, but they were more of a comfort food version. Well, not that this isn’t comfort food – usually anything with scrambled eggs is deemed “comfort food” for me. But my previous version had potatoes and chorizo and was a bit heavier and slightly more time consuming that this version that can be made with your eyes closed. Okay. Maybe only 15 if you’re familiar in the kitchen. But even if you’re not, chances are you’ve scrambled some eggs before so you can probably get these made in 20 minutes or less. 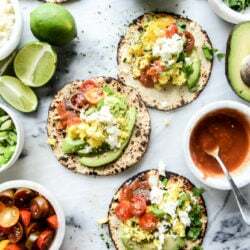 Almost everyone makes breakfast tacos and I know that they aren’t a super special thing, but I was dying to share my favorite summery version with you. I’ve also been semi-uninspired in the kitchen lately and struggling for new and exciting ideas. It comes and goes, and right now all my fun and delicious ideas are going… somewhere. Other than my brain. My must haves include the scrambled eggs, avocado and queso fresco (no other cheese) and lately, I’ve loved a big sprinkle of furikake. It just adds a touch of FLAVOR that I can’t replicate with a pinch of one seasoning. Can we talk about how Eddie DOESN’T like to eat tacos like this?! He’s not into breakfast tacos or breakfast burritos and I have no idea why. I don’t even think he has any idea why. New life goal: get him to eat a breakfast taco by September. 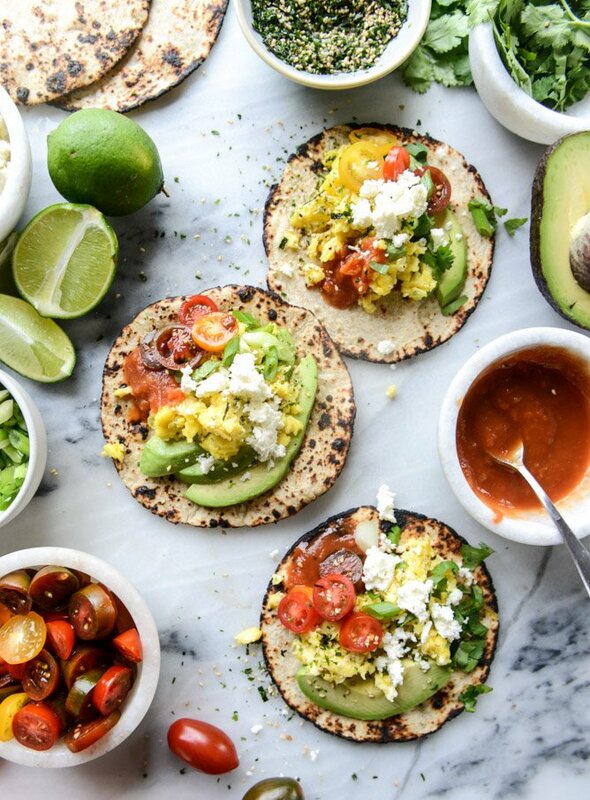 The only other thing I’d maaaaybe add to these tacos is a drizzle of pesto or a drizzle of chipotle crema or a drizzle of… something, because I’m all about the drizzle. Avocado ranch? Chipotle avocado deliciousness? Let’s figure it out. 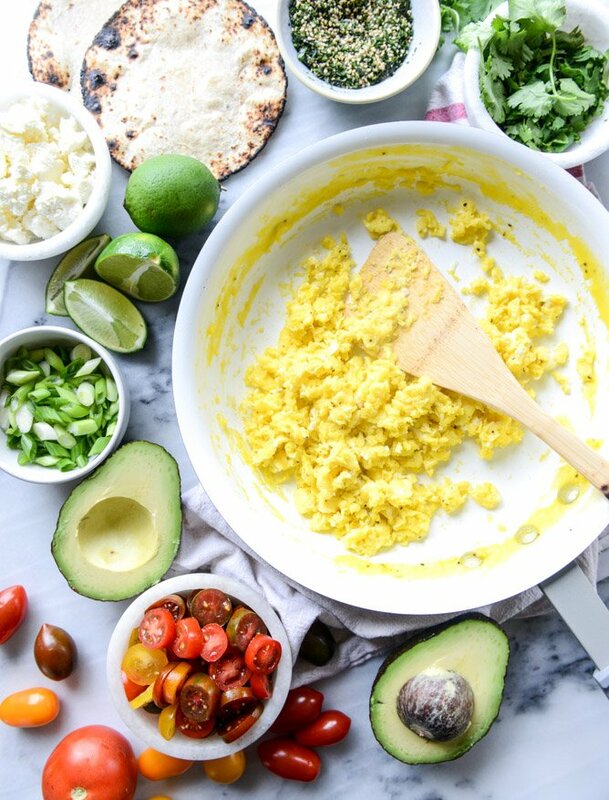 Fact: eggs taste better at dinner than they do at breakfast? Fact for me, but I’m thinking there will be a day when I make these for both. small, 4-inch corn or flour tortillas, your preference! Heat a large nonstick skillet over medium-low heat and add 1 tablespoon of butter. Lightly beat the eggs until just combined and then pour in the skillet. Stir and toss until the eggs cook, and right before them firm up, stir in the remaining tablespoon of butter and toss until it’s incorporated in the scrambled eggs. To assemble the tacos, add the sliced avocado on the bottom. Top with the eggs, tomatoes, some green onion, cilantro, salsa, queso fresco and a touch of furikake if you’d like. Devour!